was buried and then rose again! As I said on my other blog yesterday (About the Children's Department), "Resurrection Sunday is the most important day in the history of man! If Jesus didn't rise from the dead then our faith would be in vain. But He did rise from the dead! This is one of the things which sets Him apart from all the other religious leaders throughout time! I Corinthians 1512-22 . . . "We have preached that Christ has been raised from the dead. So how can some of you say that no one rises from the dead? If no one rises from the dead, then not even Christ has been raised. And if Christ has not been raised, what we preach doesn't mean anything. Your faith doesn't mean anything either. More than that, we would be lying about God. We have given witness that God raised Christ from the dead. But he did not raise him if the dead are not raised. If the dead are not raised, then Christ has not been raised either. And if Christ has not been raised, your faith doesn't mean anything. Your sins have not been forgiven. Those who have died believing in Christ are also lost. Do we have hope in Christ only for this life? Then people should pity us more than anyone else.But Christ really has been raised from the dead. He is the first of all those who will rise. Death came because of what a man did. Rising from the dead also comes because of what a man did. Because of Adam, all people die. So because of Christ, all will be made alive." (NIrV)"
Yesterday, Josiah and I were talking about Jesus' promises and how He always keeps His promises! It made my heart so happy to hear the certainty in my sweet, young grandson's voice when he talked about Jesus keeping His promises! So, when I found the following project on Pinterest today, I knew I had to make it with my grandsons and share it with you! 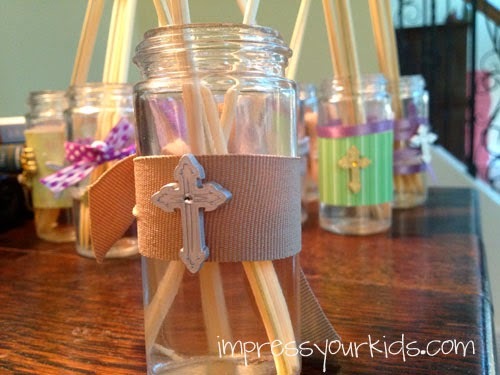 Follow this link for the specifics on making your own reed diffusers and on how to connect it with the resurrection of Jesus. As you make this project with your grandchildren, talk with them about how Jesus was anointed to be our King and how He gave His life for us so we can be forgiven and one day live with Him forever! Consider making two sets of diffusers - one for your grandchildren to take home and one to have in your own home. What a wonderful and fragrant way to draw our thoughts to Jesus and what He did for us as we celebrate Resurrection Sunday this year!